Stakeholders have called for collaborations among professional bodies, noting that team spirit among experts is critical to tackling national problems and forms the bedrock of any nation’s development. 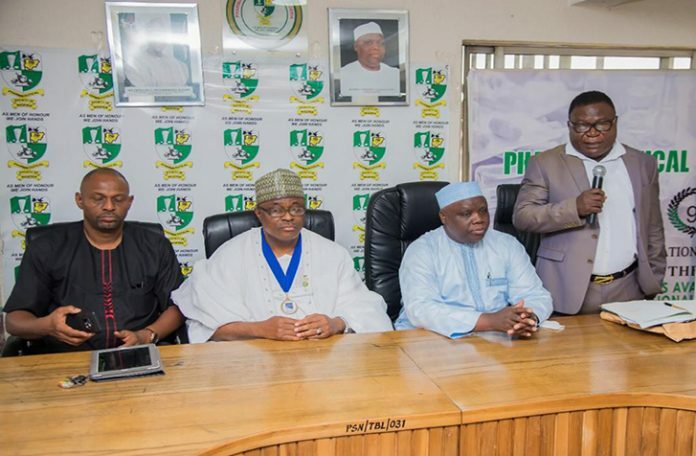 The call came when Dr. Omede Idris, President, Association of Professional Bodies of Nigeria (APBN), weekend, led top officials of the association to pay a courtesy visit to the leadership of the Pharmaceutical Society of Nigeria (PSN) in Anthony, Lagos. Dr. Idris stressed that the development of any nation completely depends on work interactions among professionals, adding that with all the professionals working together most of the problems facing the nation and the health sector could be solved. He stated that the APBN established 26 years ago has done well despite the hard times which Nigeria is going through. However, the APBN boss noted that a lot more can still be done if all professional bodies work together to build the nation. Dr. Idris who was a past President of the Nigeria Medical Association (NMA) and also a former commissioner of health in Kogi State speaking during the visit thanked the PSN for its contribution to APBN over the years, adding that a past president of PSN, Pharm. Ebenezer Ogunlana, who was also a past president of APBN made significant contributions to the association. Dr. Idris also praised Pharm. Ahmed Yakasai, president, PSN, noting that he has personally done a lot for APBN since he became the helmsman of PSN, adding that his visit to the PSN office was basically to thank Pharm. Yakasai and his executives for their support to APBN. Responding, Pharm. Ahmed Yakasai praised Dr. Idris for his style of leadership as APBN president, noting that he has always been interested in working in harmony with all professionals. He congratulated the APBN helmsman for his achievements in office as president. Pharm. Yakasai stated further that the APBN is evolving as an association, adding that the body needs to be addressing national issues more. The PSN, Yakasai added, is a proud and committed member of APBN, noting that the society has always been supportive of the body because it believed that collectively a lot can be achieved. “The PSN is committed to collaboration and partnership because we know it is the way to go,” Yakasai said. Among the dignitaries at the event were, Pharm. Tony Oyawole, APBN desk officer; Dr. John Nwaiwu, MD/CEO, JB Pharmaceuticals; Pharm. (Chief) Yetunde Morohundiya, a fellow of PSN and Prof. Femi-Mbang Oyewo, fellow of PSN.